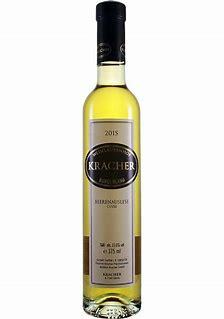 A musky note of botrytis makes for a heady, lifted nose, followed by aromas of dark fir honey and candied pineapple. The palate adds an almost grassy, herbal tinge to the proceedings, creating an intriguing edge amid the killer sweetness. The mouthfeel is dense and sticky, but bright. On the finish an array of fruit breaks loose: tart apple, apple jelly, candied grapefruit peel and candied lemon. The sweet finish lingers.